As promised, today's post goes into some of the details and insight I've gathered while weaving Samplers II, III, and IV from the book Weft-Faced Pattern Weaves-Tabby to Taqueté by Nancy Hoskins. This is a more technical post; still I hope everyone will find something interesting, or at the very least, you will enjoy the photos. Be sure you scroll to the bottom of the page for updates on the progress of other ongoing projects that I have previously mentioned. I described weft-faced pattern weaving in this post; please check it out for a refresher if needed. In that post, Sampler I was done on a plain weave threading using 2 shafts (blocks A and B). Samplers II, III, and IV are 4 shaft samplers, which doubles the options for creating patterns with the addition of C and D blocks. Each of these three samplers are woven with a straight twill threading (the order the warp yarn is threaded into the heddles). The above photo demonstrates a straight twill where shaft one is theaded, followed by shaft two, then shaft three and finally shaft four; repeating this sequence across the width of the warp. In the case of these three samplers, they are a reverse twill threading, meaning shaft four first, then three, then two, then one. What makes each of the three samplers different is variations in the tie-up (which threads raise which shafts) and the treadling (the order the shafts are raised). Sampler II is a 3/1 Twill tie-up. What does that mean? A single shaft will stay down while the other three shafts rise; considered an unbalanced tie-up. For the entire sampler, the same order of treadling is repeated - shaft one down (2, 3, 4 up), shaft two down (1, 3, 4 up), shaft three down (1, 2, 4 up), shaft four down (1, 2, 3 up). Remember the weft thread will only show over the warp (shaft) that is down; and thus a pattern develops as various colors of weft are used. On the other hand, Sampler III, a 2/2 twill, is considered a balanced tie-up. In this weave structure, a pair of shafts are down while all the other two shafts rise (balanced two and two). The rotation treadling for this 2/2 Twill is shafts one & two down, shafts two and three down, shafts three and four down, shafts one and four down. Either pair may be treadled repeatedly to build up color cubes or columns. The resulting fabric looks almost as though it has been embroidered with a pleasant quilt-like texture. So how do these different twill tie-ups effect the finished cloth? On the left (above) is Sampler II, the 3/1 twill. Look closely at the pattern motifs. Each color cube or column has clearly defined edges, known as 'clear-cut' blocks; color blocks that do not bleed into an adjacent color block. Compare this to Sampler III (on the right) which has color blocks that do bleed color into the adjacent color blocks. The colors are more diffused and the motifs have tiny toothed edges. These are called 'twill-type' color blocks. Another difference, because a 3/1 twill is an unbalanced tie-up, when you remove it from the loom, the fabric has a tendency to curl. I found this to be fairly subtle, easily improved with a good hard steam pressing. The 2/2 twill structure is sturdy and often used for rug weaving. Also, because of the smaller floats on the reverse (2 versus 3 threads), the fabric is usually reversible. Whereas as most of the weft-faced pattern weaves will look different on the obverse (front) and reverse, in Sampler IV, a 2/2 Twill on opposites, both sides are hardly distinguishable other than where you can see the ends woven into the selvedge (bottom on left side of photo). "First, a pass or one row of weaving only needs to wrap once at each selvage. If you wrap each weft around the selvage ends the edges will be bulky and ugly. Second, protect the color block at the selvages. Only the color that is supposed to be in each block at the selvage, or near the selvage should show." She offers a number of tricks on how to manage color changes and like so many skills, repetitive practice improves one's outcomes. For each sampler, I used natural 8/4 cotton for the warp and four colors of 5/2 perle cotton for the weft; varying the background, accent, and outline color choices on each. The sett is 10 (ends per inch). The finished samplers measure roughly 8 inches by 11 1/2 inches. I may eventually mat and frame them; but for now I plan to place them in page protectors and store in a binder for reference. Alpaca - The Mini Series. All the alpaca fleeces have been washed and are ready for carding or combing. I've started combing the black alpaca fleece and spinning the top as I get it prepped. 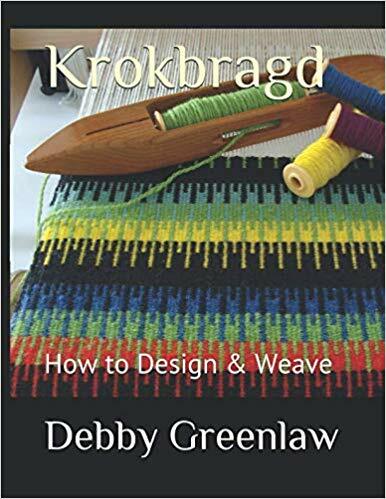 Krokbragd-How to Design and Weave. I'm right on schedule with the March 1 completion of my first draft with roughly 20,000 words written. I'm currently working on some of the samples for the book; two looms are warped and for the third I'm winding the linen warp for a krokbragd rug. I'm waiting on the arrival of three backordered colors to add to the pile of wool yarn (above) for the rug weft. On a quiet country road . . . Finally, Green Pastures Farm, Pete, and I were featured in this month's Columbia Metropolitan magazine. Here's a link to the online version of the article, I think you'll really enjoy it!